A passion project my partner and I have been working on for the last few years, slated to release as our first self-published title for PSVR. I create all the concept art, environments, color scripts, props and characters for DBC. I handle the complete loop for authoring character assets. Usually beginning from concept design, turnarounds, and emotion sheets to final models, textures, custom shaders, rigs, and blendshapes. Once in Unity, I'll configure the model, hook up its animations and evaluate effects & custom shaders the asset will need. We use a phoneme system paired with blendshapes for our characters, integrated using a powerful package for Unity called LipSync. I did modeling, blendshapes, plugin integration, animation timing, and first passes of integrating LipSync with our AI system. 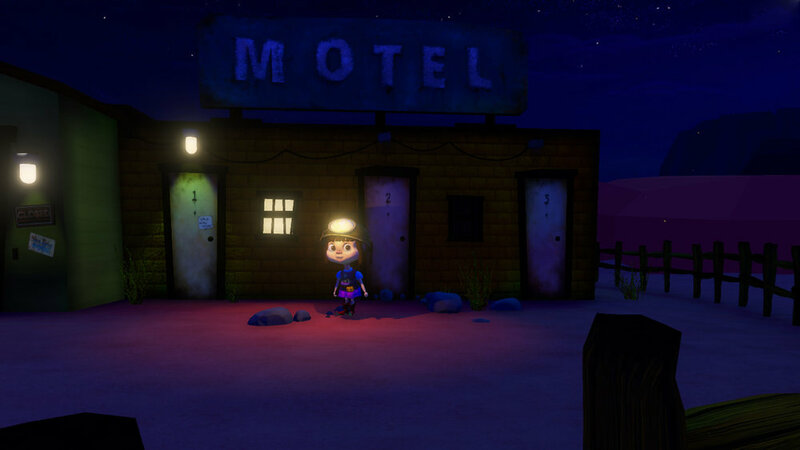 The game’s nighttime setting allows light to be a driving force in helping the Player navigate the world intuitively. Beacons on the horizon draw the Player towards them, using canned light emanating from doorways and within buildings to indicate areas of interest. Much of the game was influenced by circulation techniques in theme park attractions and museum exhibitions. 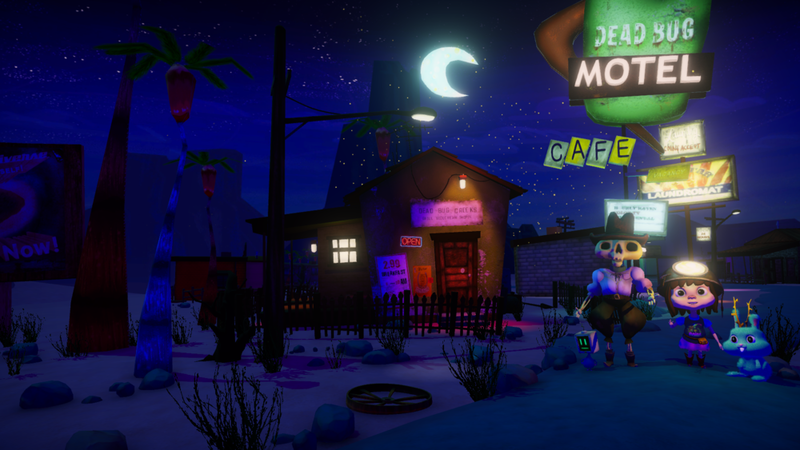 The motel sign in our main area can be seen from almost anywhere in the game. It signifies a central hub for players to come back to, with each important area branching from the sign's location. Dead Bug Creek’s environments have been crafted to elicit the best possible VR experience. When the game begins, the Player sees a sweeping view of the game world from the top of a hill, giving them a moment to view the map and acquaint themselves with the world and atmosphere. One of a few prototypes exploring hair shading. 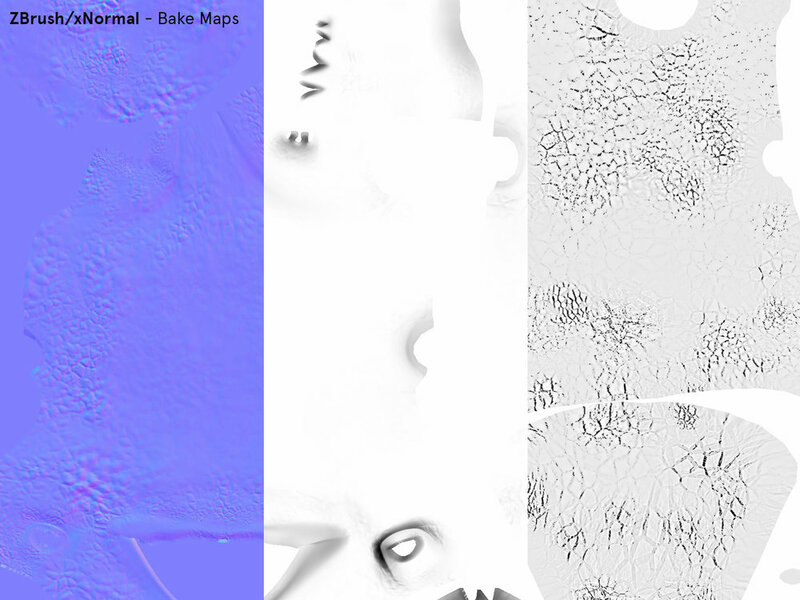 This shader isn't used in game, as I instead chose to favor shape and contrast over detail. This shader projects UVs in world space, blends multiple textures using vertex colors and a mask for soft transitions between them. A diffuse shader with an attract animation is used in our GUI to show which states are active with vertex animation and a little displacement. Everything interactive receives a highlight pulse when gazed at. This shader plugs into our AI system and works with a Material Property Block for sharing materials across multiple gameObjects. 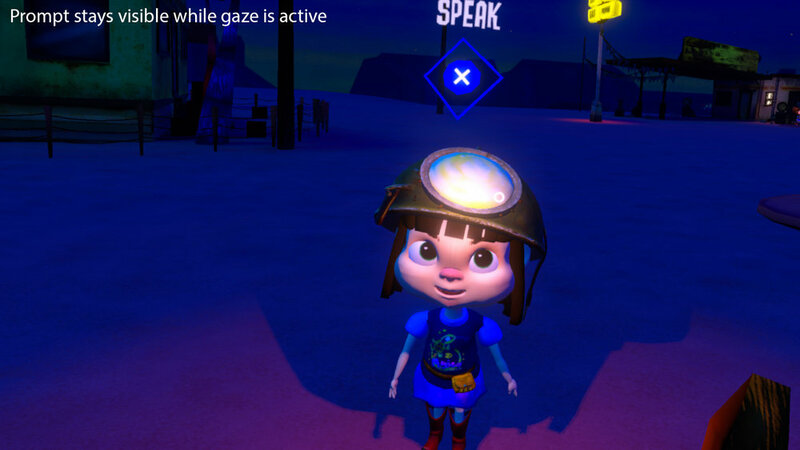 There will usually be multiple interactive objects within the Player's field of view at a given time, which was the primary driver of our in-world GUI system's design. I wanted GUI prompts to be hidden from a given distance, for interactive objects to be marked in a special way, and to be able to share assets across gameObjects and instances.